He was a big, gangly kid who wrapped his meaty right hand around a baseball and seemingly made it vanish. Not that Shaen Bernhardt knew quite where the horsehide was destined once he let loose, but he sure could throw hard, and he loved to play. That was a quarter-century ago when he was a high school junior on our ballclub at Francis Parker where I was the coach. Of course, this was small-school, private-league baseball, but we were decent. We played a lot of games, and Bernhardt patiently waited for his turn behind three senior pitchers whose concept of the location of home plate was - shall we say? - more developed than his. I quickly lost track of him because I departed prior to his senior year. So it was with eager curiosity and anticipation that I read Bernhardt's e-mail last fall. Here's what I learned: After graduating in international relations from Boston University, where he pitched for a couple of years until his elbow throbbed, he earned a law degree from Georgetown and then put a little icing on the academic cake with an MBA from the University of Chicago. A finance career in Chicago followed. In the interest of full disclosure, Bernhardt wrote that his passion for the Cubs never has waned. While living here, his apartment was a block-and-a-half from the Confines as he continued to follow the game. Today Bernhardt and his fiancée live in Zug, a 25-minute train ride south of Zurich, where they run three hedge funds. "Those details, however, are boring to all but the small circle of finance wonks interested in our particular niche," he wrote. "What actually occasions my e-mail to you is Swiss baseball. No, really." In addition to being impressed and totally befuddled by the writing ability of a student who was under my tutelage, the next tidbit really got me. Seems that Bernhardt landed a position last summer as pitching coach for the Hünenberg Unicorns of the Swiss Baseball Federation. "I threw batting practice to the guys a few times in an attempt to show them what little I knew of the craft and found myself, at 41, drafted as a player within hours," Bernhardt wrote. "If you told me three years ago I would be moving to Switzerland and pitching for the first league baseball team, I would have counted you insane." But the Unicorns knew experience and talent were in their midst. The team had split its first six games but then went on a 10-game winning streak to capture the league championship. Bernhardt hurled one of the playoff victories, a two-hitter with - by his estimation - 15 punch-outs and 10 walks. He may be living in Europe, but he's still the same guy. "I was stunned to find that, even with an intervening 22-year retirement from baseball, I could still throw an 80-mph fastball, a decent slow curve, a surprising circle change, and a nice, late-breaking slider," he wrote. "Alas (or 'Huzzah! '), I now find myself a part of 'Le Show Suisse.'" However, that show isn't particularly new. The 'Corns - needless to say, I'm already a big fan - have been around for 25 years, and there actually are three leagues in the federation. The vast majority of the players are Swiss nationals with a sprinkling of diehards like Bernhardt. Many of the athletes are just learning the game, but you won't hear any yodeling between the shortstop and second baseman. They understand infield chatter. "The Swiss are generally natural athletes," writes Bernhardt. "Despite the fact that some of the infield guys only started playing baseball a couple of years ago, they turn double plays with alarming regularity." With the 2013 campaign on the horizon, the Unicorns are seeking a coach. The former skipper, Texan Austin Proctor, stepped down and moved back to Fort Worth after the 2012 season. Only 27, he also coached Eagles Praha in the Czech Republic before moving over to Switzerland. "It was fantastic," Proctor said in a phone conversation last week. "They want to learn. They want to be better. The [coaching] pay obviously is not ideal so it's a 'must love' baseball position." With the Swiss history of neutrality, camaraderie among the players is no bulletin. "All the players are great," said Proctor. "No team chemistry problems in any way. They all like each other, and they're friends outside of the team." "Sportsmanship is a Swiss passion," Bernhardt had written in one of his e-mails to me. "The Swiss play hard and are fierce competitors, but no one headhunts, and home-plate collisions are not gratuitous." While the attitude is positive, some of the nuances of the game escape the 'Corns. "It can be frustrating," admitted Proctor. "[These] guys have never played the game before [so] tagging up on a fly ball is a struggle. It's a situation where they're trying so hard, but they don't know the game. The ball is hit to them, and they don't know where they're throwing." Of course, that's where coaching becomes the name of the game. In addition to the opportunity to genuinely teach the National Pastime . . . er, baseball, there are other benefits such as the home ballpark, known as the Rony. "[It] has a Field of Dreams feel to it," Proctor said. The Rony is just four years old - and no one should be surprised that it's a gem. I mean, this is the country that produces world-class watches. Why shouldn't they be capable of creating a beautiful ballpark? Bernhardt wrote that the Rony boasts a "regulation mound, permanent, standing wood and concrete dugouts for home and visitors, a covered and netted batting cage, bullpen tunnel, towering backstop fence, a fulltime groundskeeper, and a full set of lights." He also mentioned the "nicely-stocked" kiosk with beer, brats, sausage, soda and burgers. "There are cornfields off the first-base line, the beginning of the Swiss Alps are visible beyond left and left-center, and to the right-field side the view rolls down into the valley," Bernhardt described it in an e-mail. "It's hard to forget you're in Switzerland. The faint crack of rifles can occasionally be heard while Switzerland's citizen militia practice on the nearby Kantonal rifle ranges (don't worry, they face the other way), and it isn't unusual during practice for us to hear Alphorns echoing from the mountains, across the field, and down to the valley." I fully expected him to tell me that Heidi was their bat girl. 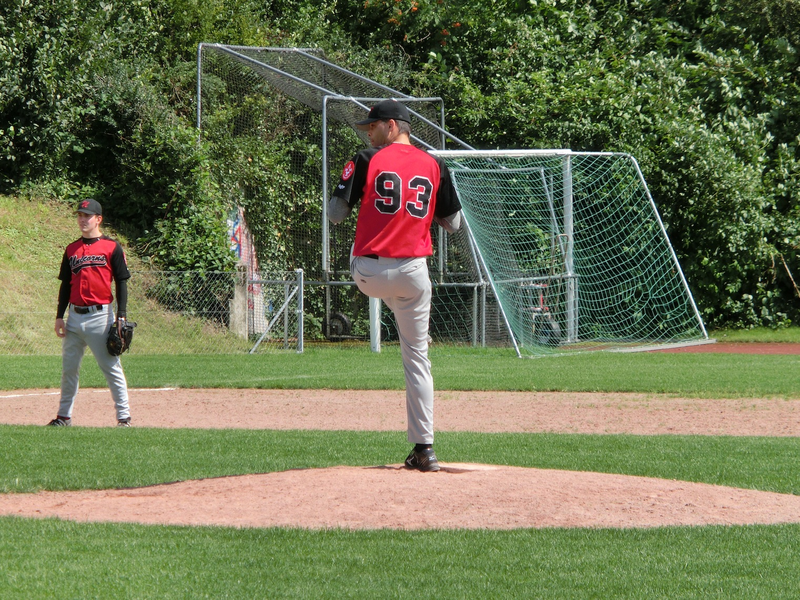 Switzerland will host the European B-level baseball championships this summer, and the Rony will be one of the sites. Bernhardt calls this a "big win" for Swiss baseball. Of course, prior to this event, the Unicorns will vie for another league championship. All they need right now is a coach. What's Ozzie Guillen doing this summer? Roger Wallenstein is our man on the White Sox and Unicorns beat. He welcomes your comments.